2 line system microwave level meter, compact and lightweight. Because very weak radio signals are used, it can be used without causing interference with other devices. 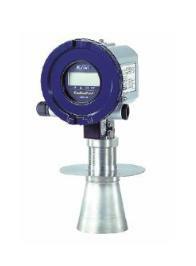 Measures levels without contact in harsh environments such as in high temperatures, high pressures, steam, gas, etc.Can be used in public areas, because weak radio signals are used. Intrinsically safe explosion structure is also available. Various antennas are available, including cone and rod types. Can be used in public areas (rivers, sea, streets, etc. ), because weak radio signals are used without any restrictions. The meter employs a 2-line system, so you do not need to put up new power lines. Just connect to conventional DC lines. The meter outputs a HART signal as well as a 4 to 20 mA DC current signal. This makes it possible to connect the meter directly to a computer. The actual measuring range is determined by each measuring condition.For details, contact to our staff.